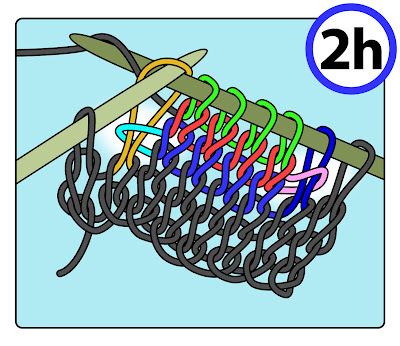 Today TECHknitting shows short row how-to: basic, wrap-and-turn, Japanese and so on. As stated in the last post (theory of short rows) short rows are made by sneaking little short rows into the middle of the work--rows which don't go from edge to edge. Illustration 1a is a schematic of these in their most basic form. Row 4 (dark blue) partial short row--starts on the right edge like an ordinary row, but is stopped short of the left edge when the work is turned at the bright blue turn-point (also called a "turn-loop"). This is a partial short row because it touches one edge (right edge) but not the other. Row "Sh" (red) a fully short row--starts at the bright blue turn-point, is worked towards the right edge but is stopped short when the work is again turned at the pink turn-point. This is a fully short row--it reaches neither the right edge nor the left edge. Row 7 (black) ordinary row, goes from edge to edge. 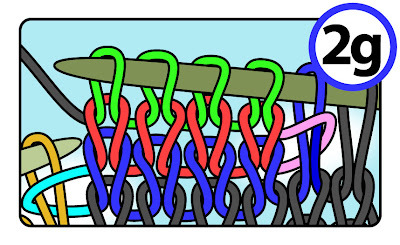 Illustration 1b shows this same schematic, a bit simplified, translated into actual knit stitches. Of the greatest interest to us are the turn-loops--the bright blue and pink bits at either edge of the fully short red row. 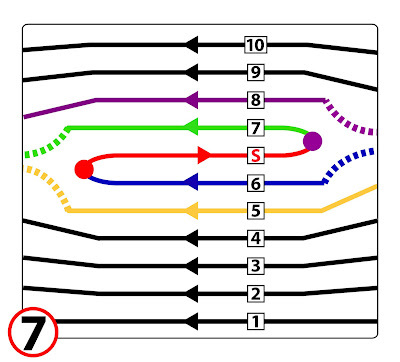 As you can see, when you simply work to the turn-points of a short row, then turn and work back, the turn loops at the short row edges aren't connected to the stitches alongside. 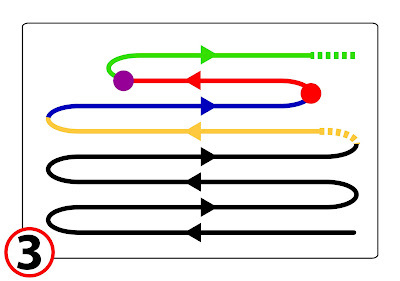 In other words, the red row is only connected at the top (to the green row) and the bottom (to the dark blue row) BUT ISN'T CONNECTED AT THE LEFT (the bright-blue turn-loop does not touch the yellow stitch alongside) NOR AT THE RIGHT (the pink turn-loop does not touch the dark-blue stitch alongside). Instead, the fabric has two HOLES at these turn-points. A very great deal of human ingenuity has been devoted to closing these holes, and different techniques have arisen. 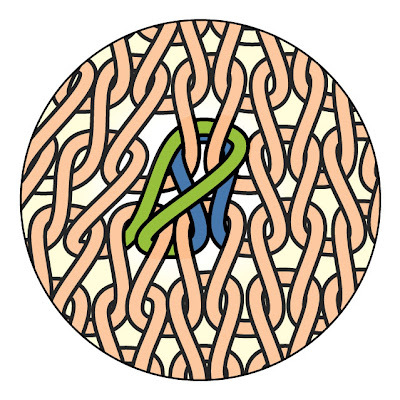 The most common techniques involve extending the turn-loops so that they are "wrapped" around the stitches alongside them. As explained in greater detail below, the wraps can either be left in place or be further operated upon by being "lifted" (also called "being unwrapped"). 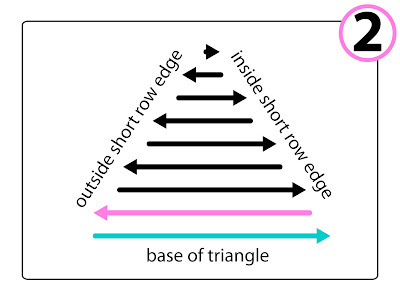 In fact, many different short row techniques can be categorized by the exact combination of "wraps" and "lifts" employed. As you can see, at their turn-points, the most basic short rows shown in illustration 1b have had their turn-loops neither "wrapped" nor "lifted," and so these basic, rather primitive short rows we've just been looking at are categorized as "no-wrap, no-lift." These are the first, simplest variation on short rows. Here's the how-to in a stockinette fabric, supposing you are working from the smooth (knit) side. Illustration 2a Knit to the spot where you wish to turn. This means to knit into the very last stitch of your short row. 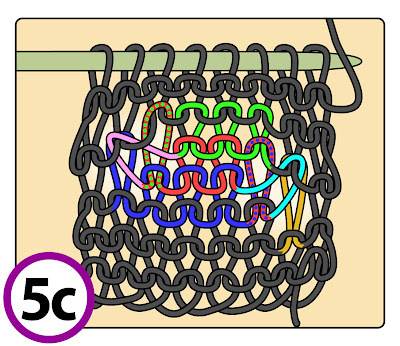 In the illustration, five dark blue stitches have been knit and the fifth stitch is the last stitch knitted before step 2b. 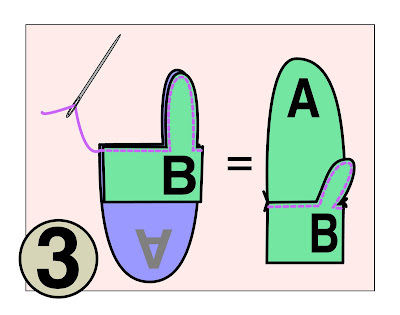 Illustration 2b: Slip the next stitch on the tip of the left needle (yellow) to the right needle and bring the running yarn (bright blue in this illustration) AROUND the slipped stitch. In other words, bring the yarn from the back to the front (towards you) between the yellow stitch and its neighbor to the left. 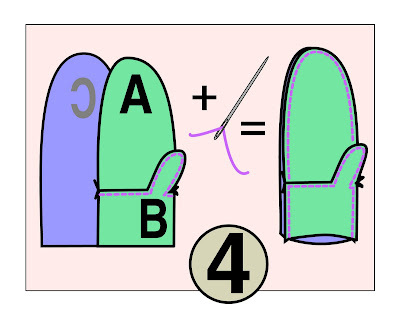 Illustration 2c: Replace the slipped stitch onto the left needle. 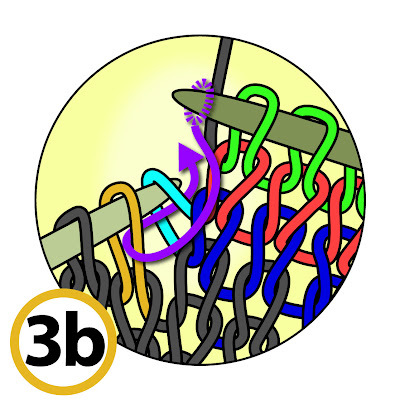 Steps 2b and c together are the "wrap" part of this maneuver--you have wrapped the bright blue turn-loop around the neck of its neighbor to the left--the yellow stitch. in the ordinary direction of work, you will now be purling back towards the same edge you set out from in illustration 2a. 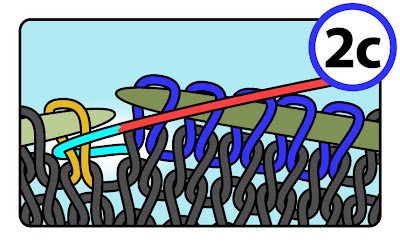 In addition to turning the work, you must also switch the running yarn (red in this illustration) forward into position for purling. Illustration 2e: The running yarn has been brought forward (towards you) and one purl stitch has been created. Now that the work has been turned and one purl stitch worked, you can better see how the bright blue turn-loop is wrapped around the neck of the yellow stitch. When all the stitches required by the pattern to be purled have been worked, the short row is ended. 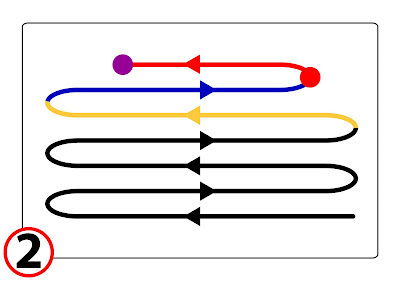 In this illustration, a 4-stitch short row (red) has been worked. On the next stitch to the left (dark blue) repeat the wrap steps (same as steps 2b and c) but this time, working from the purl side. 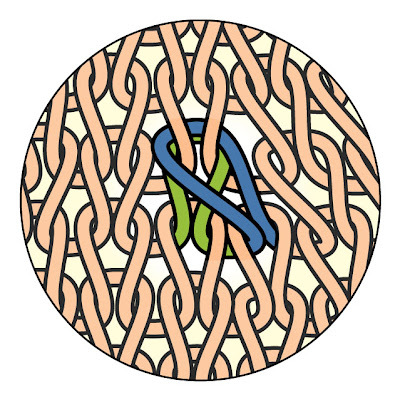 Illustration 2f shows the final result after the blue stitch has been slipped, wrapped with the running yarn (pink in this illustration) and replaced on the left needle. Illustration 2g: Turn the work again, and knit the bright green row. Now you can better see that the pink turn-loop is wrapped around the neck of the dark blue stitch alongside. 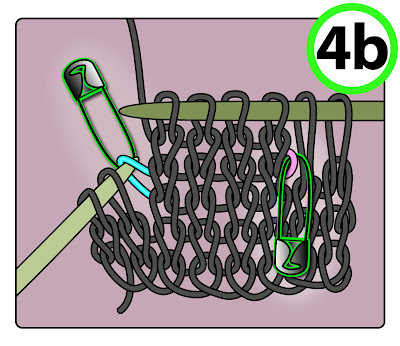 Illustration 2h: In this simplified variation of wrap-and-turn, the knitting simply continues. As you can see, this means that the bright blue turn-loop remains in where it now is, wrapped around the neck of the yellow stitch, and the knitting simply goes on without any fuss or fanfare on through to the end of the row. On the next row, simply purl all the way back. As with step 2h, the turn-loop (pink in this case) simply remains in place, wrapped around the neck of the dark blue stitch as the work goes on in the usual way. Illustration 2i shows the finished fabric. 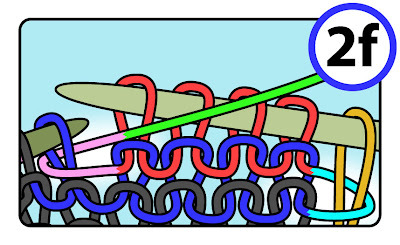 If you compare illustration 2i to illustration 1b, you'll see that they're the same with one exception: in illustration 1b, the bright blue and the pink turn-loops are not connected to the stitches alongside of them, while in illustration 2i, they are. This variation of short rows is created by "wrapping" the turn-loops around the necks of the stitches alongside. 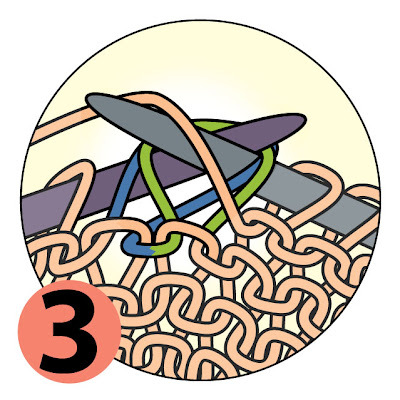 Once the wraps are created, they remain in the fabric--per illustration 2h, you simply knit or purl into the top of the stitch with the wrap around its neck. Because the wrap is left undisturbed and never "unwrapped" or "lifted" off the necks of the underlying stitches, these sorts of short rows are categorized as "wrap-no-lift" or "wrap-unlifted." For many kinds of knitting, wrap-no-lift short rows are just fine--for one example, many knitters use these for sock heels where the stacked diagonal line of the unlifted wraps make a pleasant pattern. For another example, when working in garter stitch or reverse stockinette, these wrap-no-lift short rows are actually are the best kind to use. The wrap creates a sturdy attachment, while the little bump created by the wrap remains hidden because the turn-loops are indistinguishable in the midst of the naturally bumpy fabric. The point of "lifting" the wraps (also called "unwrapping") is to hide them so they don't show on the smooth face of a stockinette fabric. This is done by lifting the wraps off the necks of the underlying stitches. 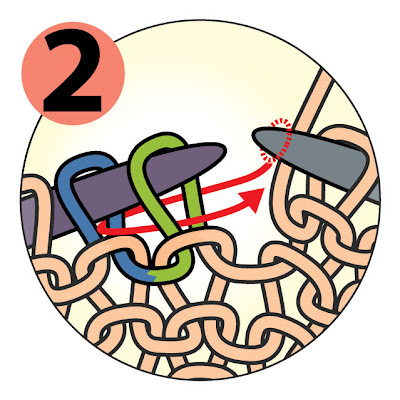 Once lifted, the turn-loop becomes a loose loop sticking out of the side of the fabric, and this loose loop can be hidden by knitting (k2tog) or purling (ssp) it together with its neighboring stitch (that being the stitch around whose neck it was formerly wrapped). The k2tog or ssp preserves the attachment between the short rows ends and the fabric, while getting rid of the bump. As stated earlier, unlifted and lifted wraps are identical up through illustration 2g, above. 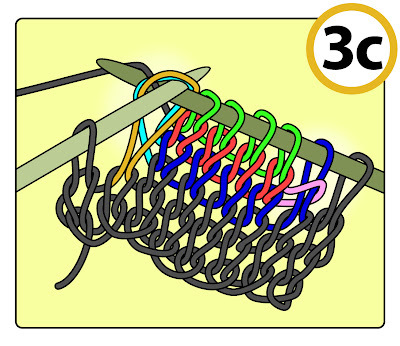 Illustration 2g shows the bright-blue wrapped yellow stitch about to be knit. In making lifted wraps, we stop there and don't go on to step 2h. Instead we "lift" the blue wrap off the yellow stitch. Specifically, the right needle is inserted under the bright blue turn-loop and used to pry ("lift") it up off of the yellow stitch. 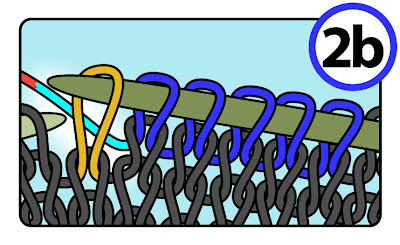 The result will be as shown in illustration 3a, below: the bright blue turn-loop now protrudes from the side of the short rows. Normally, of course, we wouldn't abandon the bright-blue turn-loop just waving around in the air like that. Illustration 3a is just for ... well... just for illustration purposes! 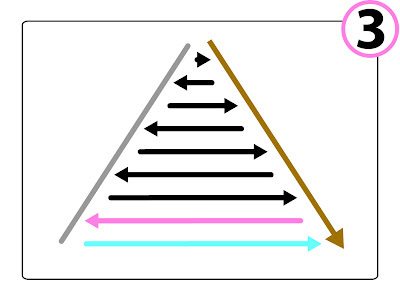 Really, what we do is lift the wrap off and deposit it straight away onto the left needle, where it should come to rest with its right arm forward (untwisted) as shown in illustration 3b, below. 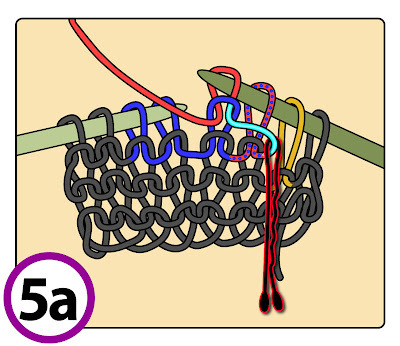 As further shown by the purple arrow, the lifted loop (bright blue) and its left-hand neighbor (the yellow stitch it used to be wrapped around) are now to be knitted together. 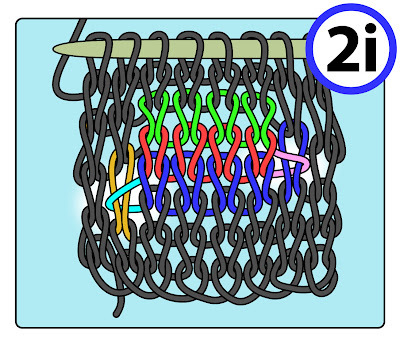 Illustration 3c shows the actual knitting together--this is an ordinary k2tog (scroll link for description). 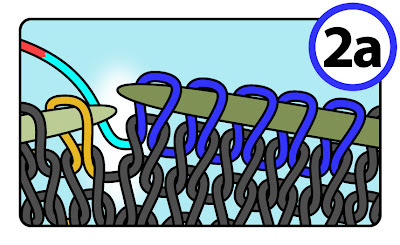 After the bright blue turn-loop has been k2tog'ed with the yellow stitch, the work proceeds to the end of the row, and then the work is turned. Per illustration 3c, in our illustration fabric that would mean that after the k2tog, only 1 more stitch remains to be knit before the work is turned to the purl side. On the reverse fabric face, purl back to the (dark blue) wrapped stitch. Now comes an awkward series of maneuvers to disengage the pink wrap from the blue stitch. You will find that you aren't really lifting the pink wrap off the blue stitch, but rather are slipping the wrapped stitch off of both needles and, while this assembly hangs in the air, using both needle tips to wiggle the blue stitch out of the pink wrap's embrace. Following the purple arrow, you will now purl the stitches together, working through the BLUE stitch first. The reason to purl them together in this position is to force the blue stitch to the fabric surface in an untwisted manner, while forcing the pink turn-loop behind, where it cannot be seen. Are you having trouble purling these together from this position? 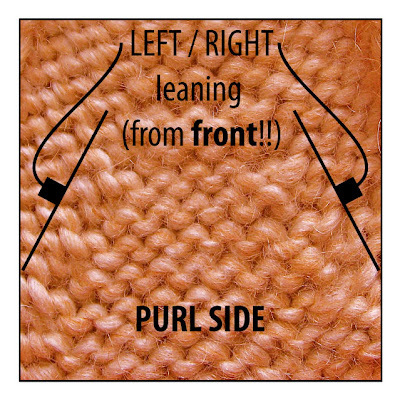 It is admittedly awkward, so if you need further help, please click on this link, and scroll to the part about "Left-leaning purl decreases" also called "slip-slip-purl" (ssp). This identical situation of purling two stitches together from the left-arm-forward, second-stitch-first position is covered in great detail at the link. After ssp'ing together the blue stitch with the pink wrap, work to the end of the row, and turn again. The fabric is now worked further in the usual manner. 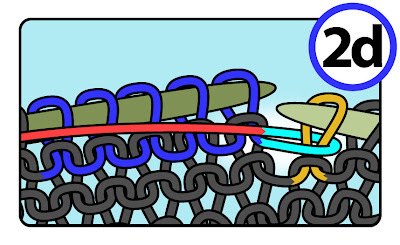 As shown in illustration 3e, unwrapping the turn-loops by lifting them off the necks of their neighbors, then k2tog'ing/ssp'ing them together with these neighbors makes a beautiful fabric. 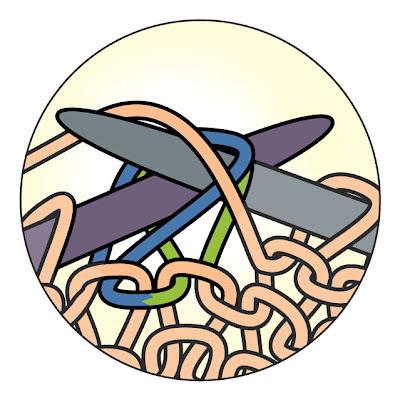 In illustration 3e, all the distracting coloring has been removed, leaving only the pink and the blue wrap still colored. As shown, it is nearly impossible to determine where the short rows are located, and the wraps are well hidden. The trick of this variation is to avoid wrapping but retain the lifting. The rationale is twofold: avoiding the extra yarn inserted at the "wrap" stage, as well as avoiding the extra manhandling of stitches which accompanies the wrapping and lifting (unwrapping). Nevertheless, the short rows must be attached, and the end result of lifting--where the turn-loop is k2tog'ed or ssp'ed together with its left-hand neighbor--looks very well indeed. So how about the best of both worlds--not wrapping but still lifting? There are two ways to lift without wrapping. 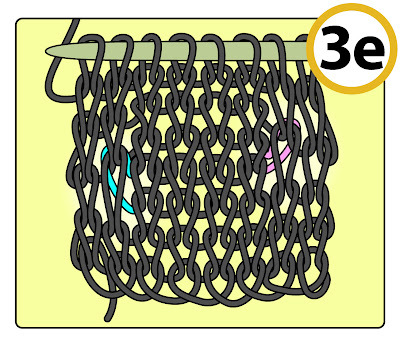 If you go back to illustration 1b, you'll notice that the unwrapped turn-loops, both bright-blue and pink, are laying between the edges of the short rows and the stitches alongside. 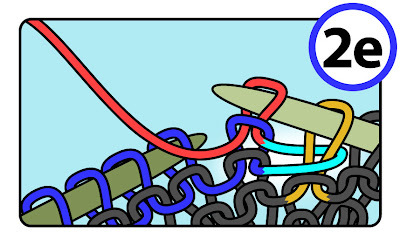 It would be possible to simply dig these turn-loops out of the fabric, lift them onto the left needle and either knit (bright blue) or purl (pink) these stitches together with their neighbors. Once lifted out of the fabric, these turn-loops would be treated just as are the turn-loops in illustrations 3b and 3d. Digging the turn-loops out of the fabric can be challenging because they're hard to see. Here's a trick to make it easier using a pin--either a coil-less safety pin or a bobby-pin. 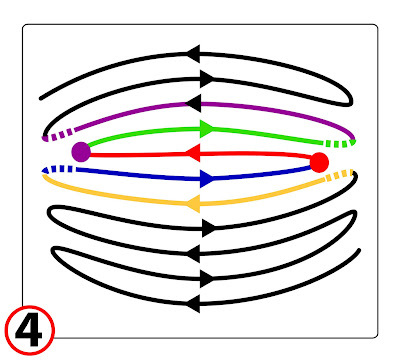 As shown in illustration 4a, as each turn-point (bright blue and pink) is reached, then instead of wrapping the turn-loops around the neighboring stitch as in variations 2 and 3 of this post, the turn loop is instead caught on a pin. If using a safety pin as shown, simply fasten it shut around--not through--the turn loop before turning the work and knitting or purling back. If using a bobby pin, simply slide it onto the turn loop and leave it there, hanging--same idea as a J-shaped cable needle, only smaller. As shown in illustration 4b, when the time comes to lift the turn-loop onto the left needle, the turn-loop can be grabbed very readily by simply grasping the pin and pulling the loop onto the left needle that way. 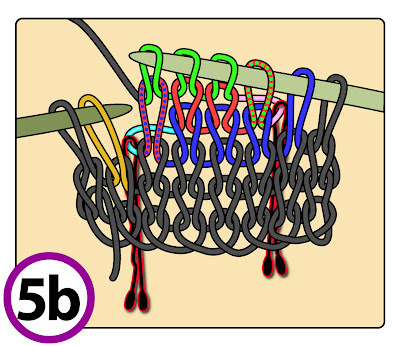 After the turn-loop is safely on the left needle and oriented whichever arm forward is required, the pin is removed and the work goes forward as shown in illustrations 3b (knit side) and 3d (purl side). The turn-loops, not having been wrapped or otherwise manhandled, are shorter and tidier. 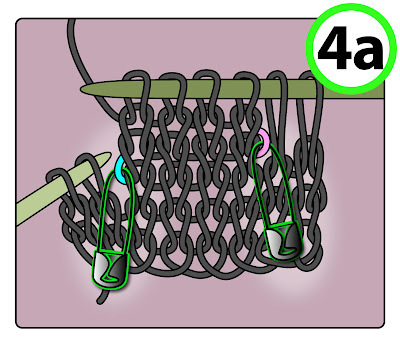 Japanese short rows combine the no-wrap/pin variation of part 4 with one more trick: slipping stitches. Slipping a stitch means there is even less yarn to stretch out, making Japanese short rows the tightest and tidiest (as seen from the knit side) of any short rows. Shown below is how the work would proceed if you were starting on the smooth (knit) side of a stockinette fabric. On the knit side, knit all the stitches right up to the turning point. 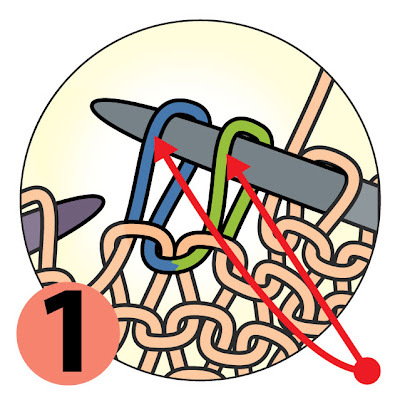 Attach a pin (safety pin or bobby pin, makes absolutely no difference) around the running yarn, in the same manner as in illustration 4a. Turn the work. Now on the purl side, SLIP the first stitch from the left needle to the right needle without working it. Illustration 5a shows the purl side of the fabric. The pin has been set, the first stitch (red with blue dots) slipped and the next stitch (red) purled. A quick note about color and orientation: in illustration 5a, the slipped stitch is colored red with blue dots. The red is to indicate that this slipped stitch is now part of the fully-short (red) row, the blue dots are to indicate that this stitch started off life as a stitch from the partial row BELOW the red row--the dark-blue row. By slipping, this stitch has been stretched up into a bridge position: it is now a member of the dark-blue row AND of the red row. Note that this dotted stitch has been slipped "purlwise" which means it was slipped open (untwisted) and right arm forward, as shown. Purl until you reach the purl turn-point. Again set a pin around the running yarn, turn the work and and again slip the first stitch from the left needle to the right needle purlwise. Next, knit to the end of the short row, finishing by knitting into the top of the stitch you first slipped. 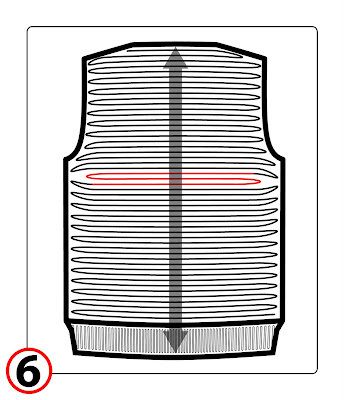 Illustration 5b shows the end result: the purl side pin has been set and all the knit stitches of the red fully-short row worked back, ending with a knit into the top of the slipped stitch. Another quick note about color and orientation: the stitch slipped in the purl turn has been colored red with green dots. The red is to indicate that the stitch started life as a member of the red fully-short row, while the green dots are to indicate that, by slipping, this stitch has been stretched up into a bridge position between the red and green rows. : the stitch is now a member of the red row AND the green row. Again, this dotted stitch has been slipped purlwise. Doesn't Illustration 5b look familiar? 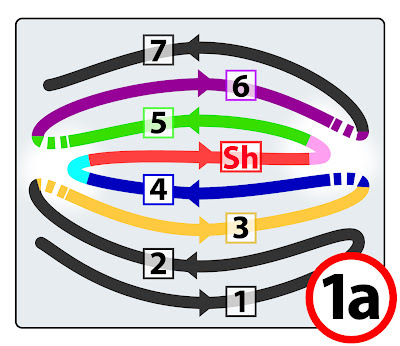 In fact, except for the fancy dotted slipped stitches, the situation is exactly the same as the classic wrap-and-turns showed in variations 3 and, especially, 4. 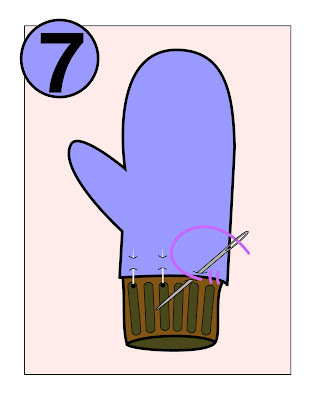 If you tug the blue turn loop onto your left needle with the attached pin and then remove the pin, you'll have the same set-up as in illustration 3b, and you continue the same as shown there. In other words, the turn-loop on the pin is pulled up onto the left needle right arm first, the pin is removed, then a k2tog is performed to work the turn-loop together with its left-hand neighbor. The fabric is then worked to the end of the row and turned onto the purl side. In the next row, when you have worked through to the purl turning point, you purl the stitch previously slipped. Next, using the right needle, you re-orient the next stitch on the left needle so it lays left arm forward, then, grasping the pin, pull the turning loop onto the left needle, also left arm forward. 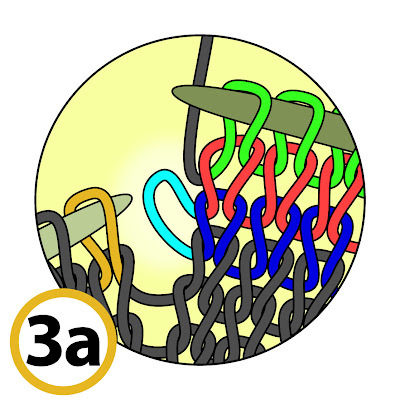 You will now have two loops on your left needle which should be laying the same as illustration 3d. 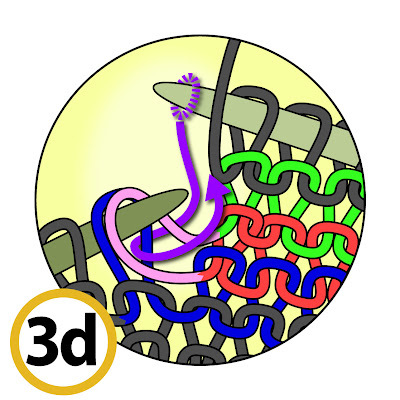 These two loops are now purled together from this position, as per the instructions accompanying illustration 3d. Illustration 5c shows the finished product from the back. You will note that the turn-loops have been pulled into "bars" across the back of the fabric. This is because they had to be pulled across the back of the dotted slipped stitches in order to be k2tog'ed or ssp'ed. 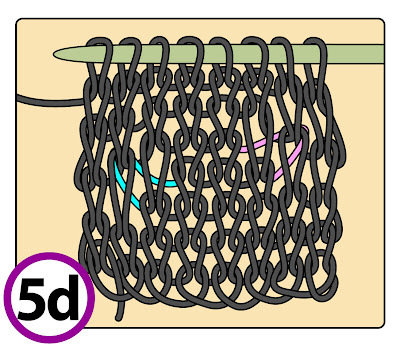 Illustration 5d shows the Japanese short rows from the front. The turn loops are colored but the rest of the fabric is not. If you compare this illustration to illustration 3e, you'll see that the fabrics are pretty nearly the same, but the Japanese short rows have fewer stitches. Having fewer stitches would translate to a tighter, tidier fabric, at least from the knit side. Variation 1 are the the most basic kind of short row a basic short row, unwrapped and unlifted--a no-wrap-no-lift short row.The problem, of course, is that not wrapping and not lifting leaves end stitches of the short row unattached to the fabric stitches alongside of them, resulting in holes at the turning point. Variation 2 are the basic wrapped short rows, where the wrap is simply left in the fabric, a wrap-no-lift short row. By wrapping the running yarn around the neck of the fabric stitch alongside before turning the work, the short row ends are connected to the fabric, eliminating the holes. When the wrapped stitches are again encountered, the wraps are left in place unlifted--the stitches with the wraps around their little necks are simply knitted or purled as if nothing was different about them. This works well on a bumpy fabric, such as garter stitch or reverse stockinette stitch, but on a smooth stockinette fabric, the wraps show as bumps. Variation 3 are wrap-and-turn short rows with the refinement of unwrapping the wraps when you encounter them again. These wrap-and-lift short rows smooth the stockinette front face of the fabric by lifted the bumpy wraps and hiding them on the fabric back via a k2tog (knit side) or ssp (purl side). Variation 4, digging or pinning the turn-loops results in lift, no-wrap short rows and digging/pinning is a further refinement to part 3. Instead of adding extra yarn to the turn-loops by wrapping them around the necks of their neighbors, the turn-loops are kept tight and afterwards either dug out of the fabric or pulled up by means of their attached safety or bobby pins. Not-wrapping not only keeps excess yarn out the fabric, but it also means the stitches are manhandled less--less flicking about of stitches and running yarn. The structure of the resulting fabric looks exactly like the finished fabric of part 3 (shown in illustration 3e) just tighter and tidier. Variation 5, Japanese (slip, lift, no-wrap) short rows, represent the ultimate refinement. Not only is the turn-loop kept tight by wrapping it around a saftey pin instead the neck of its neighboring fabric stitch, but the first stitch after the turning-point is kept tight also, by slipping it (same idea as a slipped-stitch selvedge). When the turn-loop is reached, it must be pulled by the pin out of the fabric and worked together with its left hand neighbor, and this pulling tightens the fabric even further. The wrapped-and-lifted method (variation 3) is probably the default. It has ease of execution on its side (no digging, no pins to be set and unset) and it looks reasonably well on the smooth knit side of a stockinette fabric. However, in a very bulky yarn, or a very slippery yarn, keeping the short row ends as tight as possible is a worthy goal, and for this purpose, the lift-no-wrap short rows (variation 4) probably have the advantage. However, you must balance this advantage against the cost--either the turn-loops have to be dug out, or pins have to be set and then unset, either of which is quite a bit slower than wrapping/unwrapping. Japanese short rows (variation 5) are the ultimate in tight, good-looking wraps on the knit face but have a disadvantage on the purl side of a bar along the fabric back. I personally don't use Japanese short rows for this reason, but take this with a grain of salt. I'm lazy, and don't use the dig or pin variation either (variation 4) despite thinking that this looks better than ordinary wrap-and-turn (variation 3). Notwithstanding my laziness and aversion to the bar, however, I suspect that in a couture knit--perhaps in a silk ribbon for an ultimately-to-be-lined business suit, the ultra-refined Japanese short row would be the best of all. Bottom line: as in all things knitting, different techniques have different strengths and weaknesses, and different knitters have different (and frequently strong) opinions. You must select for yourself from the smorgasbord of short rows, of which 5 different kinds are here presented. Yarn over short rows: instead of wrapping/unwrapping, a turn-loop can be made into a yarn over (yo) and this yo is then worked together with the neighboring left hand stitch from the fabric proper when the fabric has been worked to the yo location. This works especially well as an alternative to the dig variation -- variation 4. A yo can also be substituted for the pin in Japanese short rows, with the yo made after the slipped stitch. 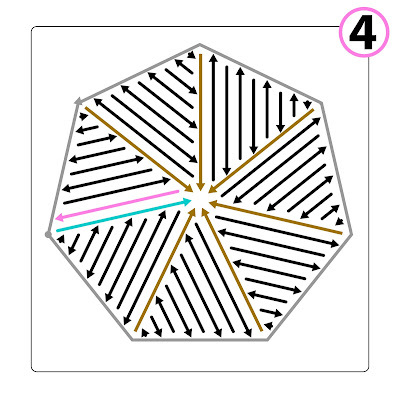 M1 short rows: the turn loop can be ignored, ie: the work can be left as in illustration 1b, with the edges of the short rows--the turn-loops--left unattached. Then, the last stitch of the short row can be k2tog'ed or ssp'ed together with the neighboring stitch out of the fabric. Lastly, the stitch count is brought back to the original number by lifting a new stitch, m1 fashion, out of the tail of the stitch just to the left of the new k2tog or ssp. I have no doubt that yet further variations exist, and confidently anticipate hearing of them in the comments, because, let's face it--knitting ingenuity is boundless! 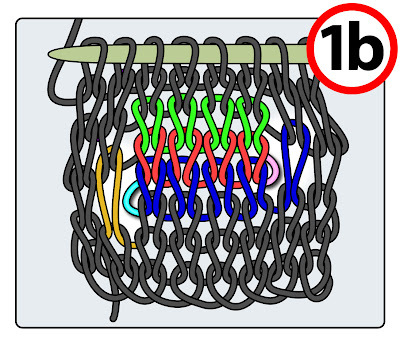 You have been reading TECHknitting blog on short row methods--basic short rows, wrap and turn short rows, Japanese short rows. The same way there are two versions of knit decreases, there are also two versions of purl decreases: the right-leaning and the left-leaning. 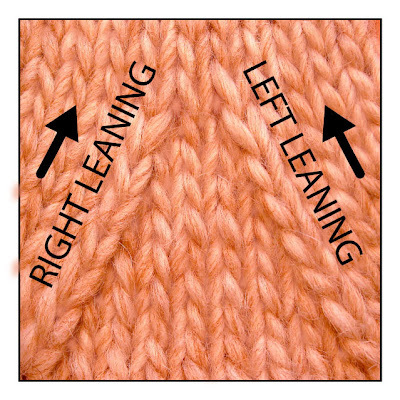 *A purled decrease which slants RIGHT as seen from the front side of a stockinette fabric is not usually called a "right leaning purled decrease." Instead, the decrease is named by its method of creation. In other words, these right leaning decreases are usually called "purl 2 together" (usually abbreviated "p2tog") because that's what you do to get them. This is a simple one step process: Instead of sticking your right needle into the first (green) stitch at the tip of the left needle and purling it, you instead stick your right needle into the first two stitches (green and blue) and purl them together, as shown below. The result, as seen from the front, is shown below. Do you see what you've done? By first inserting your right needle into the first stitch on the tip of the left needle (the green stitch) and next into the second stitch on the left needle (the blue) you have forced the green stitch in front of the blue stitch, as seen from the front (knit side) of the fabric. The green stitch has "eaten" the blue stitch to its right thus pulling the green stitch rightwards ---> over the blue stitch, and this is what forces the decrease to slant right. The slant is not purely rightwards, however, but "up and to the right" because the base of the stitches remains separated--it is only the heads which you've merged. As stated earlier, these right leaning decreases are usually called "p2tog." Step 1: Slip the first (green) stitch on the tip of the left needle onto the right needle KNITWISE. This means to insert the needle into the stitch as if you were going to knit it. When the right needle is inserted this way and then the stitch slipped off, the stitch turns away from its usual right-arm-forward orientation. Now, the left arm of the stitch is forward (towards you) and the right arm is back (away from you.) Note that you do not pass a yarn through this loop, you just slip it from the left needle onto the right one, changing its orientation along the way. Repeat this process with the next (blue) stitch on the tip of the left needle. You will wind up with both the blue and the green stitches on your right needle, and both should be laying left arm forward as shown by the red arrows. Step 2: Return the blue and green stitches to the left needle without disturbing their orientation. The end result of all this slipping and sliding should be the blue and the green stitch laying on the tip of the left needle, oriented left arms forward, right arms back. 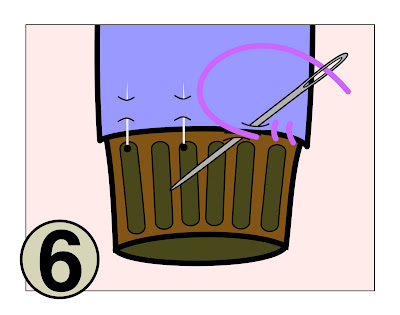 Once these stitches are parked on the left needle, you will insert the tip of the right needle into the right (back) arms of both of these stitches as shown by the red arrow. Note that the right needle is to insert from the back, first under the right arm of the BLUE stitch, and then under the right arm of the green stitch. This is admittedly a bit awkward, but persevere. Step 3: Again: once your right needle has followed the path of the red arrow, it will have been inserted first through the right (back) arm of the second stitch on the left needle (the blue stitch) and next through the right (back) arm of the first stitch on the left needle (the green stitch) as shown. Note also that the running yarn has been brought to the front before the right needle is inserted, in order to make it possible to purl. 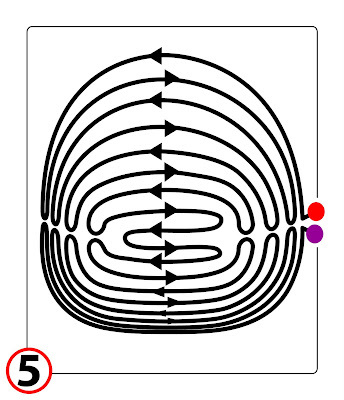 Once you draw the running yarn through these two loops, the result, as seen from the front, is as below. The loop through which the needle was first inserted, here the blue one, has been forced to the front. This blue stitch has "eaten" the green one to its left, which pulls the blue stitch <---- leftwards over the green stitch, so the decrease slants to the left. The slant is not purely leftwards, but rather "up and to the left" because with this decrease, as with the previous one, the base of the two stitches remain separated, it's only the heads which you've merged. As stated earlier, this left leaning decrease is sometimes called "p2tog" just like the right leaning decrease is. However, it is more commonly called "slip, slip, purl" (ssp) or sometimes "purl 2 together through the back loops," (p2togtbl or p2tbl). *after the re-orientation steps (in other words, when you get to step 3) then if you first insert your right needle through the SECOND (blue) stitch on the left needle tip and then through the first (green) stitch, the blue will be pulled <---- leftwards over its neighbor and the resulting decrease will slant left as seen from the front of a stockinette fabric. 1. Some instructions for a left leaning purled decrease ignore the re-orientation steps (steps 1 and 2) and instead jump directly to purling through the back loops (step 3). The result is a twisted loop on the front surface of the fabric--not so pretty. 2. If your decreases are to be viewed from the purled side of a stockinette fabric (reverse stockinette side) then it really makes absolutely no difference how you make them, so make the one-step right leaning decreases because they are easier and quicker. The reason it makes no difference is because in the purled and bumpy landscape of a reverse stockinette fabric, the orientation of the loops will simply not show. As long as you're making the purled decreases where you ought to be (on the side of the marker as specified by your pattern) you'll get the result envisioned by the designer. It's only when viewed from the persnickety and smooth front (knit) side of a stockinette fabric that the direction of lean is important. Addendum, added 10-13-09. In the comments, Rachmouse asks for a photo of these purl decreases from the purl side. Here you go Rachmouse! You have been reading TECHknitting blog on "Purled decreases: p2tog, SSP, p2tbl, p2togtbl"
This post is about lining front-thumbed mittens, and is part 2 of a series: the first post of this series was about lining mittens which have side thumbs. As with the side-thumbed mittens, we are using Polar Fleece for lining. In the illustrations below, the "good" (fluffier) side of the polar fleece is illustrated in blue, and the "not-so-good" side is illustrated in green. 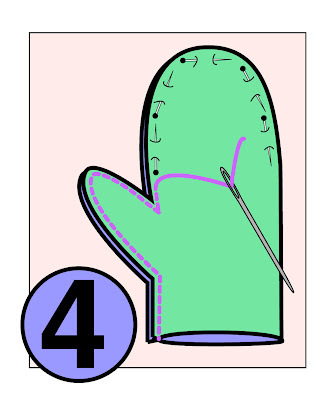 Step 1: Lay out the mitten on a piece of Polar Fleece, and trace the back of the mitten. 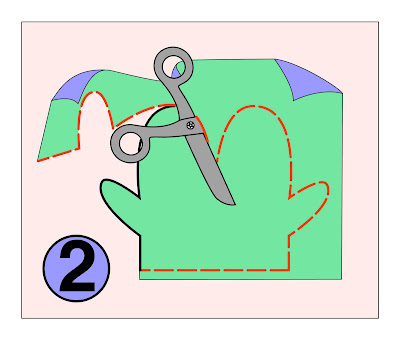 This is pattern piece "C."
Step 2: Flip the mitten over with the thumb pointing up towards the top of the mitten. Trace along the bottom (cuff) line, then up both sides to the level at which the thumb starts. 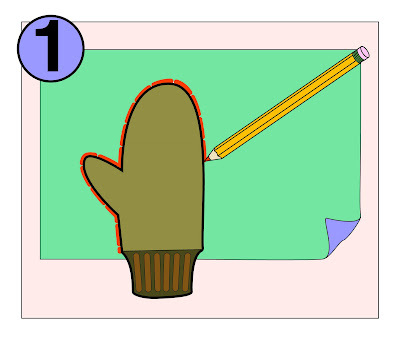 Next, draw a straight line from the side of the mitten to the base of the thumb, then trace the thumb itself. This gives pattern piece "B." The last pattern piece to cut is "A." With the thumb now facing down towards the cuff of the mitten, and the front of the mitten against the lining material, trace the top of the mitten and down both sides to the level of the thumb. Draw a straight line across to where the thumb starts, then trace the the thumb itself. 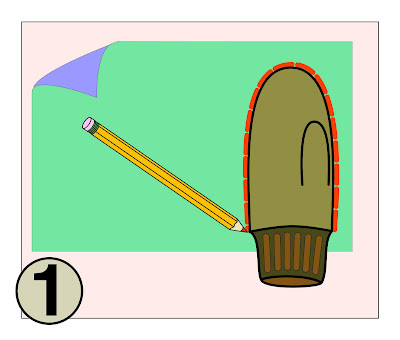 The end result is as shown: your lining material with the three pattern pieces "A," the top part of the mitten front with a tracing of the thumb, "B," the bottom part of the mitten front with a tracing of the thumb, and "C," the back of the mitten. 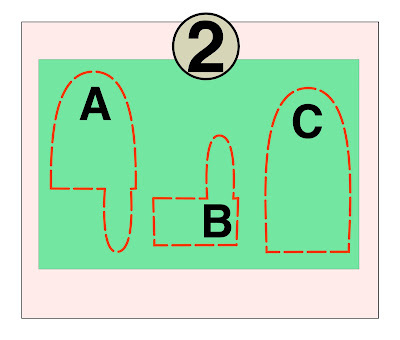 Step 3: Holding the "good sides" of A and B together, sew as shown. When you unfold the two after sewing them together, you'll find that you've made a pretty good front-thumb. As to the sewing: if you have a sewing machine, this will take only a few short moments and you don't even have to find a matching thread and bobbin, because no one is ever, ever, going to see this seam. If you're sewing by hand, a good stitch to use would be the back stitch. Step 4: Now, sew the back piece, C, onto the front piece made up of A+B. After this bit of sewing, you will have a finished mitten lining. Step 5: slip the lining form into the mitten as shown, with the seamed side out. This way, the seam will be trapped between the lining and the inside of the mitten, never to be seen (or felt) again. Step 6: finish the process by turning the whole works inside out, so the "good side" of the lining is showing, and the mitten is actually inside out, completely inside of the lining. Sew the lining to the mitten using the overcast stitch. 1) There is no seam allowance left for three reasons: First, you WANT the lining to be smaller than the mitten. Second, fleece can be sewn awfully near the very edge: because it can't unravel, you need not have very much seam allowance at all: 1/8 inch is enough, and 1/4 inch is a lot. Third, fleece stretches, so you don't have to be nearly as precise with fleece as with woven cloth. 2) The cuff is not usually lined in mittens: this would make the wrist stiff. 3) Mittens to be lined must be knit sufficiently large to accommodate the lining and your hand. This means making the mittens longer and wider, and it means that the thumb must proportionately be kitted quite large indeed in order to prevent the finished, lined mitten thumb from strangling your actual thumb. You have been reading TECHknitting blog on "lining mittens with fleece." Today's post is the first of a two-part series on lining mittens. 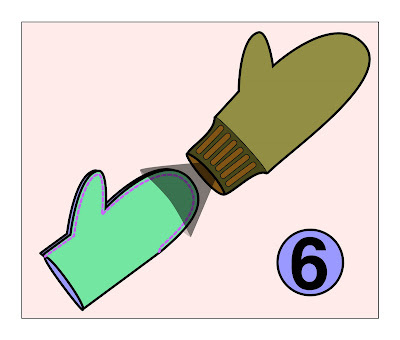 The illustration below shows the two main types of mittens: those with a thumb coming from the side, and those with a thumb coming from the front. 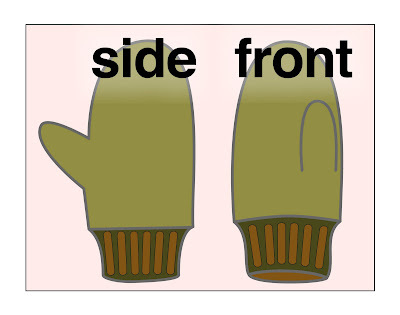 In this post we'll line a side-thumbed mitten, and the following post shows the front-thumbed version. In the illustrations below, the "good side" (the denser, fuzzier side) of the polar fleece fabric is illustrated in blue, the "not-so-good" side is illustrated in green. However, if keeping track of the sides is going to turn you away from using Polar Fleece, then, as set forth in greater detail at the very end of this post, just ignore that part of the instructions. Step 1: Trace the outlines of the mitten on the not-so-good side of the polar fleece stop when you get to the straight part of the non-thumb side. 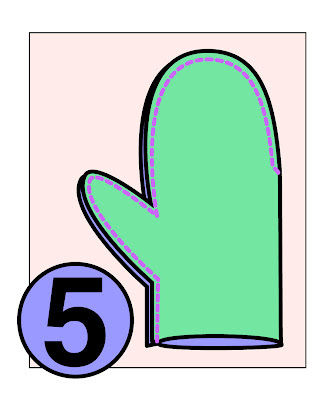 Step 2: flip the mitten over and trace it again, so that you get a double outline, joined along the outside edge, as shown. Cut out this shape without separating the two halves. 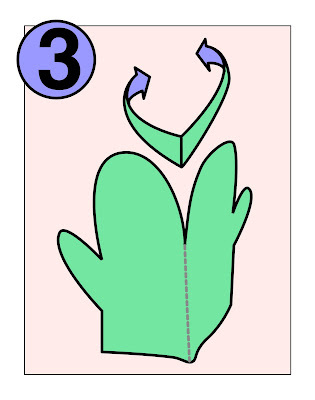 Step 3: Fold the shape in half along the dotted line, with the not-so-good side out and the good sides together on the inside. Step 5: The sewn mitten lining form. Note that the seam is on the outside, and the "good side" (i.e. : the fuzzier side) is inside the form, where it will snug against your cold hands. Step 6: Slip the lining form into the mitten with the "not-so-good" seamed side facing out, as shown. Step 7: Once the lining is inside of the mitten, flip the whole business inside out, so that the "good side" of the lining is outside, while the whole mitten (flipped inside out) is inside the lining form. Pin the lining to the mitten, and sew, using the overcast stitch, as shown. For more information about sewing lining into a knitted garment using the overcast stitch, click here. Once the lining is sewn in, flip the whole business inside out again, and you've got yourself a lined mitten. Second, if you want to line a mitten, you have to knit it bigger (both wider AND longer) to make room for the lining. This is particularly true of the thumb which must be knit proportionally even bigger than the mitten itself, in order to accommodate the lining without cutting your circulation off and leaving you with a blue thumb. Three, as you see, the cuff is not lined. It is obviously possible to line a cuff, but this tends to make the wrist stiff, and the mitten uncomfortable and unpopular. If you truly want to line the cuff, you must knit it quite loose to avoid these problems. Lined cuffs are not usually ribbed. The last thing is this: As stated above, if you are confused by all this talk of "good side" and "not -so-good side," the good news is that on most Polar Fleece, it really doesn't matter much. There is a relatively rare kind of fleece which only has one fuzzy side, but on double-sided fleece, then unless you look pretty closely, it can sometimes be hard to tell which side even IS the fluffier "good" side. If all this chatter about sides is bogging you down down, then make sure to get double sided fleece, and just ignore these distinctions. 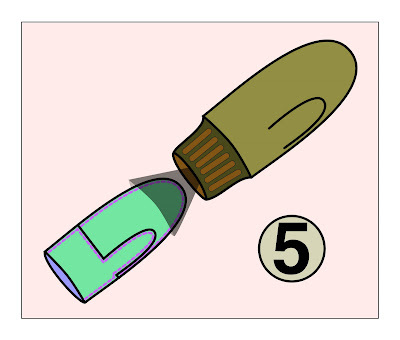 The only really important thing is to insert the lining form with the seam on the side of the lining away from your hands, as shown in illustration 6. ADDENDUM, 3-12-11: If your mittens aren't fully side-thumb, but only "sorta side thumb," have a look at Purple Muse's comment, comment #8 below, for a clever way of dealing with the situation. You have been reading TECHknitting on "lining hand-knit mittens"